This is an Open tournament (anybody can enter). As part of the European Grand Prix (a good performance gets you points towards the overall title), there will be the opportunity to meet many players from the international community. There will be a wide range of standards present. 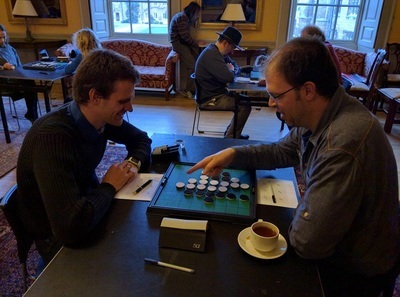 It is a Swiss tournament with finals which means that everybody plays every round with progressive rounds tending towards games of similar standards. The top four from the Swiss compete in the finals for the places. Due to the Cambridge Half Marathon taking place on the Sunday some roads will be closed (details here). A number of bus routes are also affected. In case you arrive on Friday, we are all meeting up at the Salisbury Arms on Tenison Road in the evening. The Saturday meal is at the Raja, which is a nice Indian restaurant near Trinity [about 10 minutes walk]. But we are booked for 6pm (everything is very very busy that evening, and that was the only time I could get), which means that there will not be time to go anywhere (like guest house or hotel) between last round of playing and dinner. - Takuji Kashiwabara has won in 12 of the 14 organising countries and came very close to claim a 13th flag. 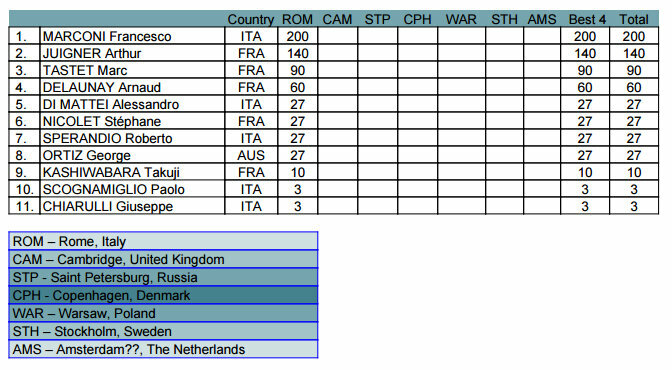 But after this weekend United Kingdom (Cambridge) and Russia (Moscow / Saint Petersburg) are still missing on his list. 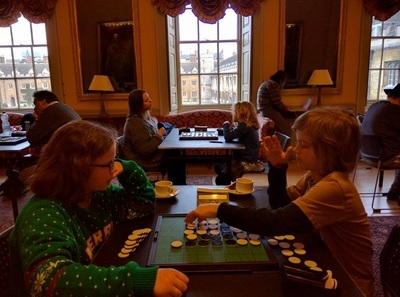 - Lucy Brand is now the youngest participating girl in any European Grand Prix tournament. She's taking over the record from Tani Turner, who played her first EGP at the age of 9 year and 178 days. Lucy Brands new record is 8 year and 182 days. - Marc Tastet has improved his own 'oldest podium' record and has put it onto 53 year and 106 days. 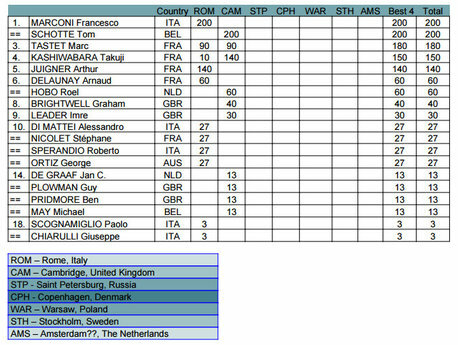 - It took Tom Schotte 6 years and 153 days to win another European Grand Prix tournament. At 5 occasions it took a player longer than this to win another tournament: Francesco Marconi still has this record with no less than 12 years and 230 days in between two victories. 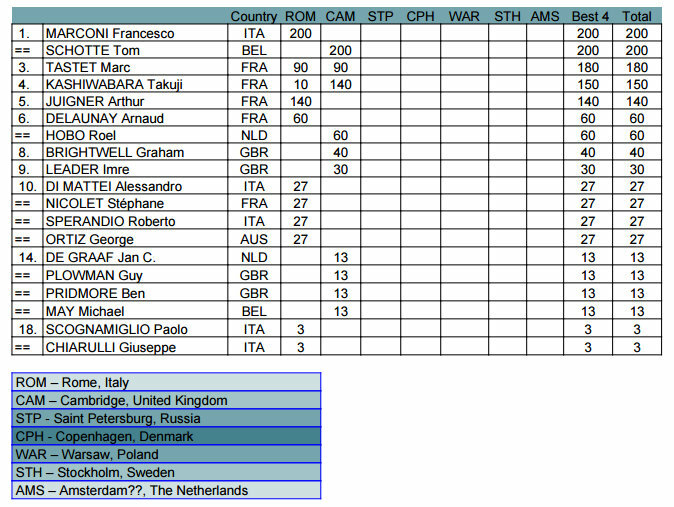 Also Marc Tastet, Karsten Felborg, Imre Leader and (again) Francesco Marconi took a longer 'break' at some point. 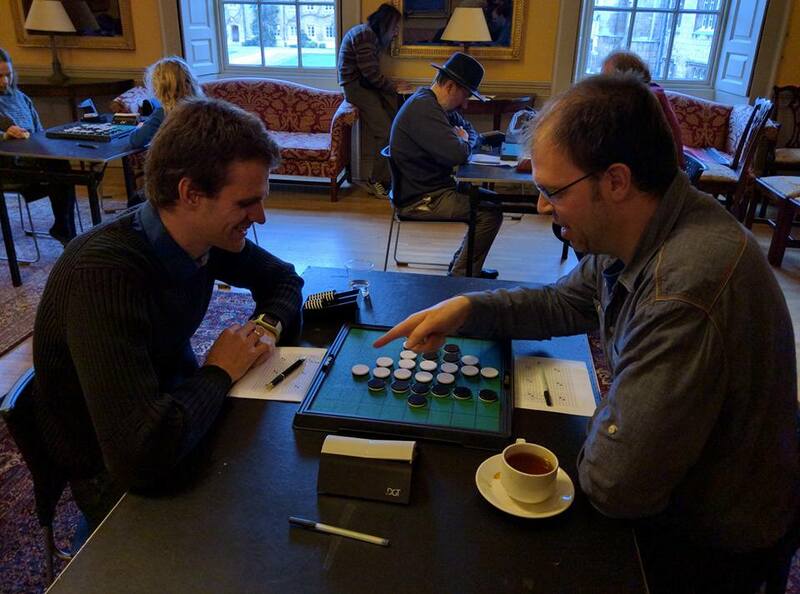 ​- Cambridge EGP 2016 featured 6 players that had won an EGP tournament, totalising 64 victories. 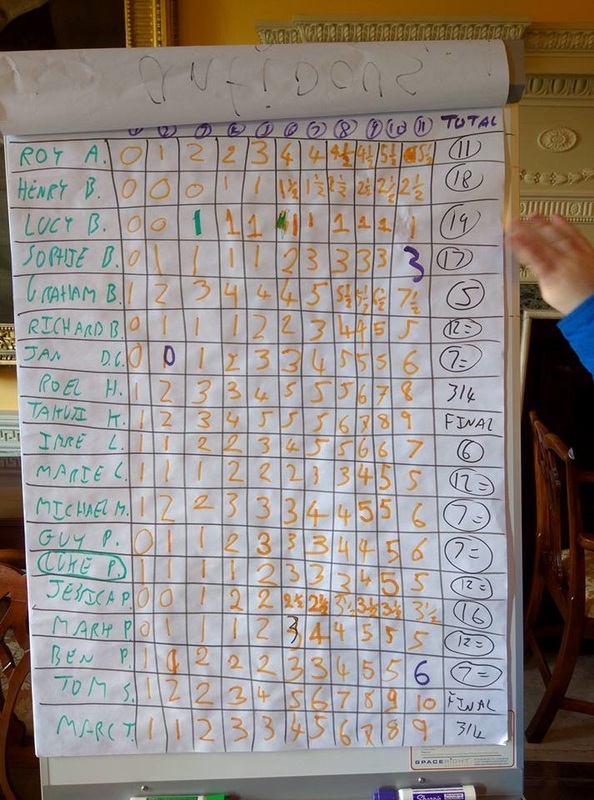 - 4 players at this tournament won 20 of the 30 European Grand Prix Champion titles. 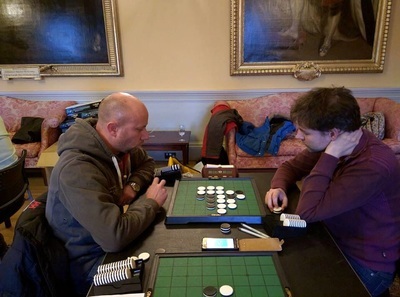 BRIGHTWELL Graham 43-21 DE GRAAF Jan C.
The 4 players in this picture totalise 20 of the 30 European Grand Prix Champion titles. 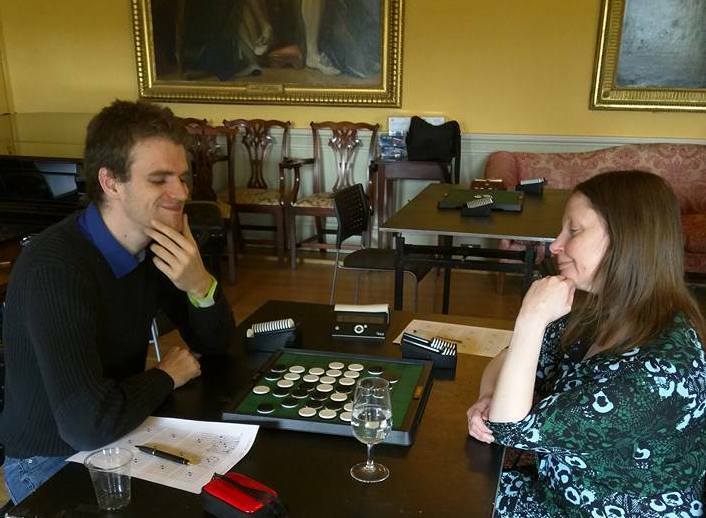 Great first day of tournament for Belgian player Tom Schotte, he leads with 6 points. 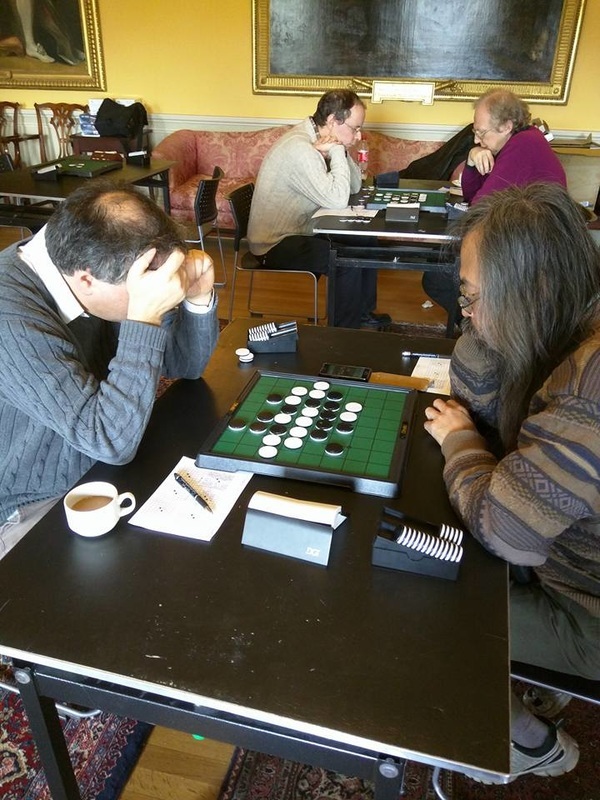 The only game he lost was against Takuji Kashiwabara in round 3. 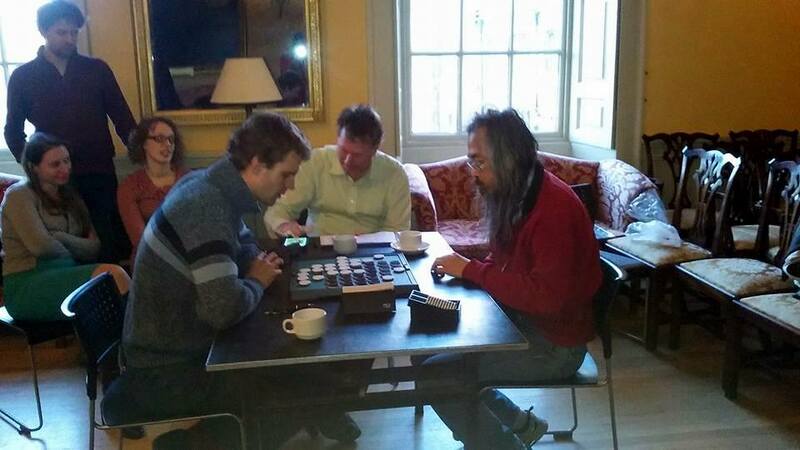 Second place with 5 points: Takuji Kashiwabara, Imre Leader, Graham Brightwell, Marc Tastet and Roel Hobo. Ofcourse anything can happen on the second day but most likely the finalist will be on of these 6 players. 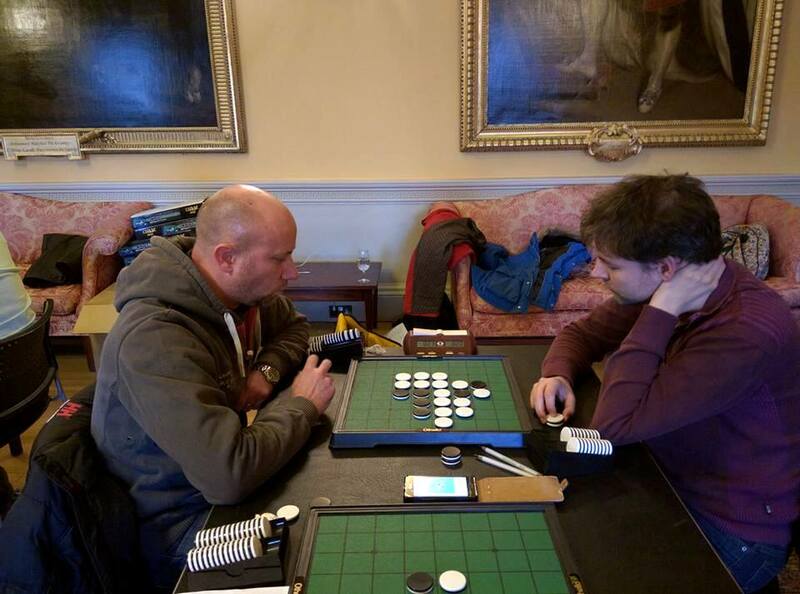 Graham Brightwell had not played at the EGP for 10 years, he made a great come-back so far. 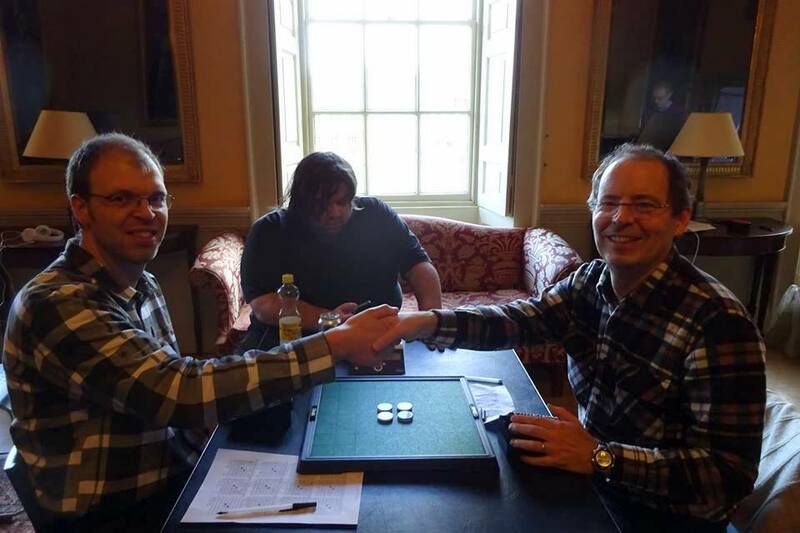 Tom Schotte won the remaining 4 rounds on the second day of tournament and finished the Swiss rounds with 10 wins. He made sure he earned a spot in the final. What did the 5 players do that had 5 points after day 1? 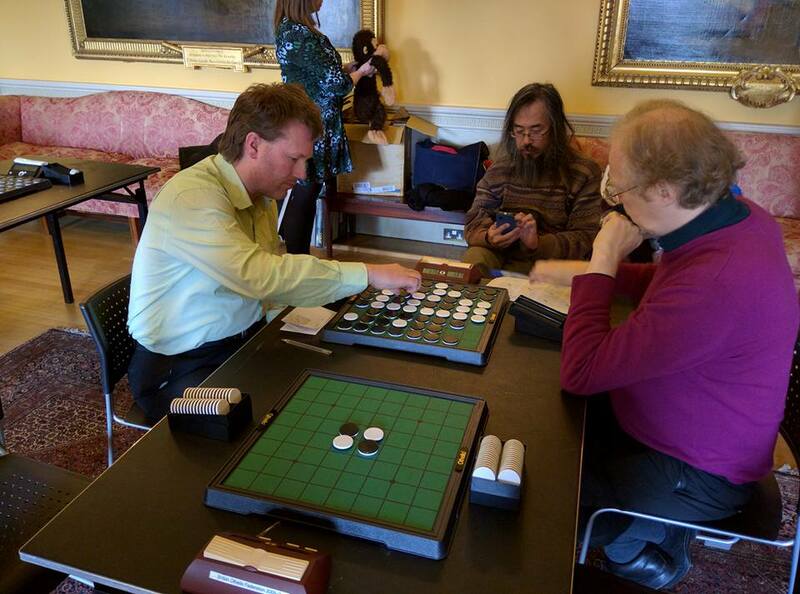 Well, Takuji Kashiwabara won 4 games, Marc Tastet won 4, Roel Hobo won 3, Graham Brightwell won 2 and had a draw and Imre Leader won 2 games. Takuji Kashiwabara qualified for the final, Marc Tastet just missed out on the final by a couple of discs. That's the second EGP final in a row that he missed on tie-break! Marc Tastet and Roel Hobo qualified for the playoff for 3rd and 4th place. Graham Brightwell finished 5th and Imre Leader 6th. I'm in the final! What a surprise... I have won the Swiss with 10/11 and will be playing Takuji Kashiwabara in the final (the only one I lost against). Takuji Kashiwabara won the first final game 33-31. Tom did not win the next two, but he managed to force a draw in the second game and he won the last game 33-31. As Tom won the Swiss rounds, the victory went to him. It was a very exciting final! Well done and congrats to both! This is Tom's 3rd EGP tournament win. He won Ghent and Prague in 2009. Up till now Takuji Kashiwabara won EGP tourneys in 12 of the 14 organising countries. The two he lacks on his victory list are United Kingdom and Russia (he never attended a EGP there). Even if he decides to play in Saint Petersburg next April and wins, he will have to wait till 2018 to get another shot at making it 14/14. 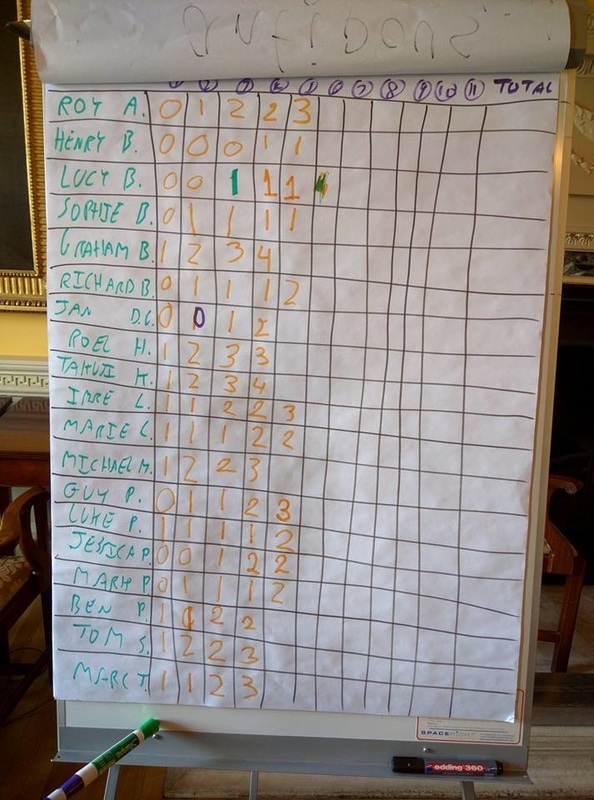 The playoff for 3rd place was won by Marc Tastet. The playoff was probably my best game of the tournament. After move 29, Black is threatening to play g1 without White having access to d1. For example, 30f7 31g1 and even if Black has no immediate access to d1, White has no way to arrive in d1 before Black (who can always play b6 to get access). something else (Roel played 31b6) and White can answer 32h6, getting definitely access to d1. - 30h6. If Black answers 31b6, White plays 30h2 and it transposes into the game as it was played. But if Black takes the five with 31h7, on 32h2, Black has to take the corner 33h1, there is 34g1 35g2 36d1 and Black has an extra move with 37g6 which leaves White in a difficult position. So I chose the first option. Analysing the game now, I realise that after 30h6 31h7, White could play 32g1, preventing Black to play there and attacking the five. Also I realise that there was a third option at move 30, namely 30g2 which I never considered. For example, 30g2 31d1 32h2 or 30g2 31b6 32d1 33c6 34h2. 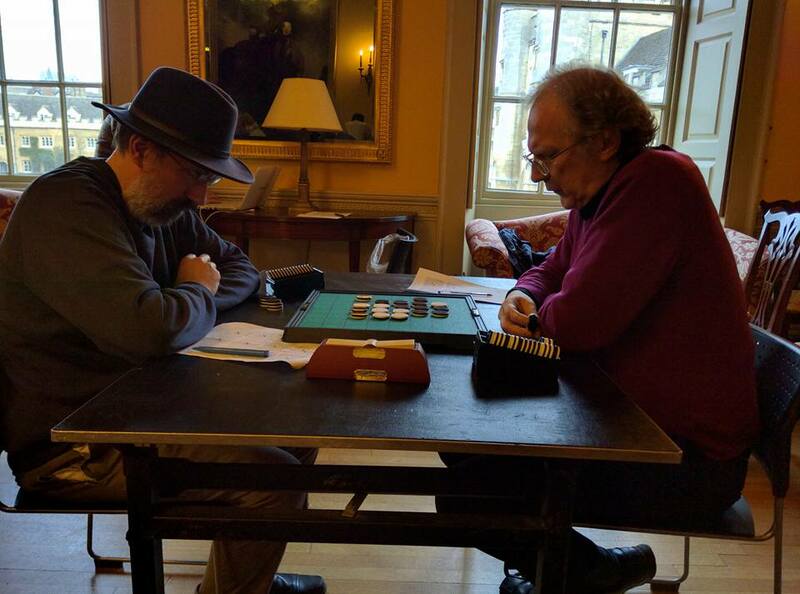 At move 46, I was ready to play f7, that I had considered from move 38, but decided to keep in reserve to play at the right moment. But if 46f7, Black can control the diagonal with 47b7 and that annoyed me. So I chose to play 46b7! forcing Black to play 47a8 and then I could play 48f7 safely. At move 52, as it was a one-game playoff (so the score was irrelevant) I just tried to find a winning sequence with as few choices as possible for my opponent.